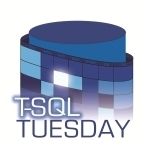 T-SQL Tuesday is the brain-child of MVP Adam Machanic (blog|twitter). It happens once a month on the 2nd Tuesday and is hosted by a different person in the SQL community each time. The idea is to get the SQL Community blogging on a common topic on a single day of the month after which a round-up of all the participating posts are done by the hosting blog owner to give the SQL community a one-stop shop of some great articles on a single topic. What is the topic for July? a. A set of T-SQL best practices that you follow in your shop that or you believe that should be followed always. It could be as specific as for writing only linked server queries or writing queries for SSIS packages etc. b. An issue that you resolved because certain T-SQL best practices were not followed. c. A workaround that you used (like query hints) to resolve an issue where T-SQL best practices couldn’t be implemented due to involvement of a third party solution. Over the years of troubleshooting SQL performance related issues, I have found on multiple occasions that the T-SQL query in question was performing badly because certain best practices for writing that piece of code were not followed and the one responsible for the development had not foreseen that such an oversight could become a bottleneck when the data or the number of users increased. So, I thought it would be a good idea to get the SQL Community’s thoughts around best practices in this area. Sometimes, the most obvious things are the easiest to overlook! T-SQL Tuesday has some basic rules which are pretty easy to follow. 1. Your post must be published between 00:00 GMT Tuesday July 12, 2011, and 00:00 GMT Wednesday July 13, 2011. 2. Your post must contain the T-SQL Tuesday logo from above and the image should link back to this blog post. 3. Trackbacks should work, but if you don’t see one please link to your post in the comments section below so everyone can view your blog post. Being creative always fetches brownie points and gets a smile from the reader! Before I wrap-up this post, a big thanks to Adam for letting me host T-SQL Tuesday for this month! Mike Walsh has already documented about the above three points in an earlier post on SQL University DBA Week. So what am I going to talk about in this post….. Well, since a major part of my daily job involves working on critical situations which sometimes involve disaster recovery, I will talk about some key but simple points that you should be aware of while restoring your database[s] in case your server encounters a disaster. 1. Always have backups – This point no matter how many times reiterated is still less! You should always have backups of your databases. You should store your backups on a separate media which is not the same as the disk drives which store the database files. This ensures that you don’t have a single point of failure. I have seen a lot of scenarios where the backups and the database files are stored on the same drive. Once the drive goes BOOM! !… You are left with zilch!! A bad scenario to be in! 2. Test your backups – Just taking regular backups doesn’t ensure that you will be safe when a disaster strikes. You need to restore your backups and ensure that the backups can be restored successfully. If you have an automated DR strategy in place, then it is always good to perform dry-runs to ensure that your team is well versed with the recovery process when the need arises. You don’t want to be grappling with your restore scripts during a crisis situation. The next nugget of information is to ensure that a DBCC CHECKDB on the restored database completes without any errors. Just because the restore was successful, doesn’t mean that the database is consistent! 3. Know your environment – An application doesn’t just depend on your database[s]. There might be customized connection settings, connection aliases, specific logins, database users, linked servers etc. which need to be kept handy in case you need to bring a new environment online which was a clone of your previous disaster ridden system. I have seen multiple times where the databases have been restored successfully but the logins and linked specific to the application are missing. So now you have an environment which has the application databases but other specifics pertaining to the application’s functioning are missing. 4. System databases need to be backed up also – System databases do need to be backed up as well. Eg. Without the master database backup in a disaster scenario, you will be missing the necessary logins that your application needs to login to the user database. 5. Benchmarking is very important – As I mentioned earlier, a dry-run is very important. This is primarily due to the fact that if you do not know how much time a restore is going to take, you cannot define your RTO and adhere to your agreed SLAs. A classic situation is that the application needs to be up within 4 hours but since no once tested the entire restore cycle, no one knows how long it will take to restore the set of full/differential/log backups that are available. 6. Have multiple points of failure – This is mostly considered as a good to have but in critical environments, I consider this as a must-have! A simple implementation of this would be redundancy. Keep two copies of your database backups. If one set of database backups are inconsistent, you have a redundant set of backups to fall back on. A decision taken to disk space by reducing the number of redundant copies can look very daft when you are not able to bring a production system online due to the unavailability of consistent backups. 7. Never rely on REPAIR ALLOW DATA LOSS as your savior – The REPAIR ALLOW DATA LOSS option provided with CHECKDB should always and always be your last resort! This means that when all else fails, then you resort to repair options. This repair option should never be your first option for recovering from a disaster because as the name states it always results in data loss!! 8. Know how long a CHECKDB takes to complete on the database – If you do not run CHECKDB regularly on the database for which you are creating a DR strategy, then you are inviting trouble. Always run periodic CHECKDB on your databases and note the time taken so that you have a fair estimate on how long a CHECKDB should take to complete successfully on the given database. 9. Redundant database copies – A lot of environments use Database Mirroring, Log Shipping and Replication to maintain duplicate copies of the database. If you are using any of these features to maintain copies of the existing databases, then you need to note two things: first being the latency between the primary and secondary copies. This will define your RPO as the average latency will be the amount of data loss that you should be prepared to deal with and this will also define RPO to some measure as the time taken to recover the missing data would be defined by latency. Another point to keep in mind is that if you decide to use one of the alternate database copy of the database as the new production database, then you need to ensure that you avoid certain gotchas. Example: Orphaned users for SQL Authenticated logins when you use log shipping or database mirroring. 10. Keep in mind the additional SQL Server features being used – If you are using replication or mirroring or log shipping on the primary database being recovered, then you need to account for additional steps before restoring the databases as a simple restore of a database backup for such a database will not do. Eg. Special considerations need to be followed for restoring replicated databases. A checklist of required tasks for each recovery scenario. To help you review how disaster recovery progressed, initial each task as it is completed, and indicate the time when it finished on the checklist. The above points might seem like basics but it would be surprising that they don’t get religiously followed on some production environments! This month’s recurring SQL blog party a.k.a. T-SQL Tuesday started by Adam Machanic (blog | @AdamMachanic) is being hosted by Bob Pusateri (blog | @SQLBob). This month’s topic is about Common Table Expressions which was introduced for the first time in SQL Server 2005. CTEs can be thought of as a derived table which can be self-referenced within a query. With the advent of CTEs, a lot of T-SQL developers made full use of this feature. Personally, I have used CTEs for various data collection and parsing scripts that I use for daily for my day-to-day work. I am a big fan of CTEs and have introduced their usage in one of the blocking reports for SQL Nexus. As with any coding construct, the use of CTEs has it’s PROs and CONs but in this post, I shall not go down the path as there are a lot of depends on whether a particular scenario is fit for the use of CTE of a temporary table. That decision has to be made based on testing against the benchmarks that you have or response-time SLAs that have defined for your application. During my tenure here with CSS, I too have relied on the Process Monitor to troubleshoot some fairly complex issues. Sometimes the Process Monitor .pml files can be quite large if collected without adding appropriate filters and I am just interested in a particular process(es). By importing the .PML file into a database, I can not only query the imported data using T-SQL queries but I can also write quick automations to look for common stack traces that I know have known issues/problems associated with them. Yes with Process Monitor, you can use locally cached symbols to get the call stack of the function call as well. Note that saving a .PML into XML with resolved stack symbols is slow due to the time taken for symbol resolution. The .XML file that I will use as an example was saved using the “Extensible Markup Language (XML)” option with “Include stack traces (will increase file size)” option enabled. I captured a Process Monitor trace while trying to access a directory which was not present on my server. I already have a stored procedure to import the saved .XML file into a database table, then parse that existing data and insert the parsed data into the two tables that I have created to stored the event and stack information. How does the use of CTEs fit in here? The logic here is that the cteXML used below extracts all frames for a particular event using a counter variable and creates XML data for each of the frames which are parsed by referencing the cteXML in the INSERT INTO…SELECT query. Below is a screenshot showing me that the directory doesn’t exist and the call-stack associated with the function call that failed. The scripts containing the Stored Procedure definitions and table schemas can be downloaded from here.